A car drives through the so-called Chandelier Tree in California’s Underwood Park in the 1930s. An iconic giant, this 315-foot-tall redwood was tunneled out as a novelty during the early days of gas-powered cars. I remember driving through this tree with my family when I was 12 or 13. We had a great big Dodge van at the time, and the door handles barely missed the sides of the tree tunnel. It was so cool, but I remember thinking that it was too bad that whoever hollowed out that tree had no respect for such a lovely Redwood giant. Thank goodness the tree managed to stay alive. Check out the other ten sacred and iconic trees, such as the baobab, the dance tree, and the Bohdi tree, at National Geographic. This is our daily open thread — Enjoy the trees! We can see into the future — VOTE!! The funnest right of each and every idiot — to own/use Guns and bear bare Arms — shall never be infringed. It’s as sick as it is inevitable. This week a reality TV show is broadcasting the killing of a wolf in Montana. “It’s the funnest thing I’ve done in years,” the gleeful host crows after shooting the wolf with a high-powered rifle. Viewers flocking to the northern Rockies to join in this “fun” will [soon] have even more chances to kill wolves . . . Interior Secretary Ken Salazar is rushing the approval to ensure Wyoming’s wolf-kill plan will be carried out as scheduled this fall, even though the U.S. Fish and Wildlife Service rejected a similar plan by Wyoming last year . . . Wyoming’s plan will allow wolves to be indiscriminately killed outside Yellowstone National Park and a few other safe havens: 80 percent of the state will become a wolf-killing zone. That means close to 200 wolves — highly social animals with intricate family structures — will be shot or trapped to death. Many of them just had pups this spring. If the government has its way, it will be open season on Wyoming’s wolf families. The reality show host/wolf killer calls wolf advocates . . . “a bunch of wingnut screwballs” for trying to save the wolves. Apparently, in the world of reality TV, basic humaneness earns you screwball status. “It’s the funnest thing I’ve done in years.” Right. And of course IF he might one day be disallowed the right to own a gun (much less use one indiscriminately), then there would never again be a “funnest thing” available to him for doing, and he would surely soon succumb to boredom and lack of fun, an intolerable (and absolutely un-Amurkan) consequence. By this Sunday, most of Wyoming will be transformed into a free fire zone for wolves. We are leaving no stone unturned in our efforts to stop the killing before it begins. Under current Wyoming state law, wolves in 85 percent of the state will be subject to unlimited and uncontrolled shooting, trapping and gassing starting at 12:01am September 30. Only weeks ago, Interior Secretary Salazar stripped Wyoming’s wolves of Endangered Species Act (ESA) protection. It was pure politics. We have already served notice that we are filing a lawsuit against the federal government’s removal of Endangered Species Act protection for Wyoming wolves. But by the time our case is heard it will be too late for many of Wyoming’s wolves, unless the State abandons its indefensible plan. Up to 60 percent of Wyoming’s wolf population could ultimately be wiped out. The restoration of wolves in the lower 48 is one of the greatest success stories of the Endangered Species Act. The withdrawal of ESA protection and approval of an indefensible wolf management plan turns the clock back on decades of conservation progress. We have already seen what can happen if the fate of wolves is turned over to states with extreme anti-wolf plans in place. The 2011 delisting of Idaho’s wolves was disastrous and deadly — more than 400 of that state’s wolves were killed within the first year of delisting. And more than 100 of Montana’s wolves have met the same fate. Now Wyoming is poised to follow suit with an even worse wolf plan. No other animal has gone from protected wildlife to predatory “pest” status overnight — until now. Under Wyoming’s plan, wolves that wander beyond the invisible border of the northwest corner of the state can be shot, gassed or trapped by anyone at any time. No license required. It’s open season on wolves, plain and simple. No other animal — not bears, not mountain lions — are subject to the double standard that permits wolves across much of the state to be shot as vermin. In only hours, Wyoming’s extreme wolf-killing plan will go into effect, and Defenders is calling on our supporters to shine the spotlight on this shameful management plan. Guns. More than 150 years ago, American poet Emily Dickinson wrote, in one of her many moments of brilliance, a poem which speaks from the point-of-view of a Loaded Gun, a hunting rifle. Can’t help but note how brilliantly she summed up the concept of armed idiocy in the last two lines: “For I have but the power to kill, / Without — the power to die.” In today’s uninformed but popular vernacular, that would undoubtedly (and sadly) be viewed as “the funnest thing” of all. In a recent interview with a Nevada television station, Ann Romney, in addition to confessing should her husband outdo the more heavily favored snowball in Hell and actually win the election this November, said that her main concern would be for his “mental health.” But she also said something that reinforces a common right-wing lie. She said, “This economy has been under his control for the last four years, and we have seen no jobs,” Romney said. “It’s been a jobless recovery.” That is not true. Most Americans do not know how their U. S. Senate operates. It is not exactly a democratic (small-“d”) institution. A minority of Senators, even a single Senator, can stop legislation from even being debated, let alone voted on. The Senate operates primarily through unanimous consent. A Senator will rise and say, “Mr. President, I ask unanimous consent that the Senate proceed to consideration of the bill such-and-such.” The presiding President of the Senate asks, “Is there objection?” If any Senator stands up and says, “I object,” the motion is not agreed to and nothing further happens with the bill. The objecting Senator not only does not have to state the reason for his or her objection, they do not even have to be personally present to object. It can be done through a proxy. This maneuver can even be used when the other 99 Senators favor passing the motion in question. And if that doesn’t work (and it often has), there is always the threat of a filibuster to block action. The filibuster was the reason why Ann Romney was repeating a lie. In order to get anything done in the Senate, you have to have 60 votes to bring cloture, an end to debate. Despite having a majority in the Senate, the Democrats have not had the 60 votes needed to overcome a filibuster for most of Obama’s term. In fact, he’s only had the 60 votes (counting two Independents, one of which was not reliable) for about four months, not two years. The Republican Party has used the filibuster many times this Congress to block legislation that would actually benefit average Americans. They even used the filibuster to block the Veterans Jobs Bill. That bill now must go back to committee and won’t come up for another vote until after the election. And don’t get me started on the GOP’s refusal to even consider raising taxes on anyone, even those who could easily afford it and wouldn’t miss it. There is no honor in the Republican tactics used to block legislation from passing. Oftentimes, the motion in question would have the support of a majority of Senators (true, most of them Democrats, but that’s how Democracy works), but Republicans would band together to prevent it from coming to a final vote just because they would lose and President Obama and the Democrats would win. No other reason. It’s not a question of what’s morally right or wrong, it’s simply a refusal to let the democratically-elected majority do what the country sent them to Congress to do. We can’t let them have even forty Senators in the next Congress, or President Obama will achieve nothing in his second term. A term, by the way, the Republican strategy was designed to prevent. Do they have any ideas that will work? This is our daily open thread. You can talk about the harm the Republicans are doing to this country, or any other topic you wish. Let us know what you think. Cross posted at Pick Wayne’s Brain. September 28, 2012 Music Night! If for some reason you’re unfamiliar with The Walkabouts, it may be time to catch up. I find Carla Torgerson’s voice hypnotic. They were originally a Sub Pop band out of Seattle, but their real fan base has been in Europe for a long time. (And it turns out that the two founders went to my alma mater). Cool video, too. Happy Ask a Stupid Question Day, all y’all!! This awesome day came about because teachers wanted kids to ask more questions in class. 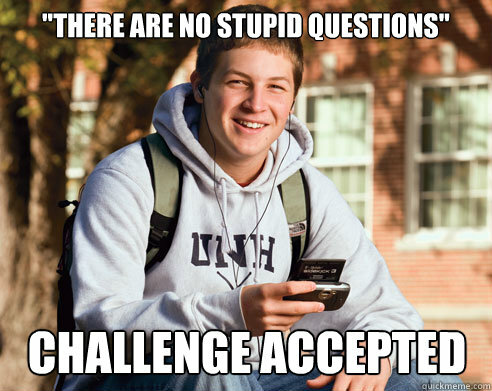 Actually, I think asking a stupid question, even on Ask a Stupid Question Day, might result in ridicule. What’s your favorite stupid question? Wait, is that a stupid question? If I have to ask, is that a “yes?” Oh dear…I think I’ve cornered myself. Here’s my favorite stupid question: Do we have any wine? This is our daily open thread — It’s Friday! !